Have you found an online vendor selling Pirate's Grog No. 13? The aroma promises fruits and floral tastes, but not overly sweet with a touch of wood to balance. The taste however is mostly burn. Mixing it makes it palatable, but at this price bracket I don't think we should need to resorting to that. Not aged long enough to turn the floral flavor of golden rum into plume flavors of dark rum, but it is decently smooth drink. Shame it costs 60 bucks instead of 20. 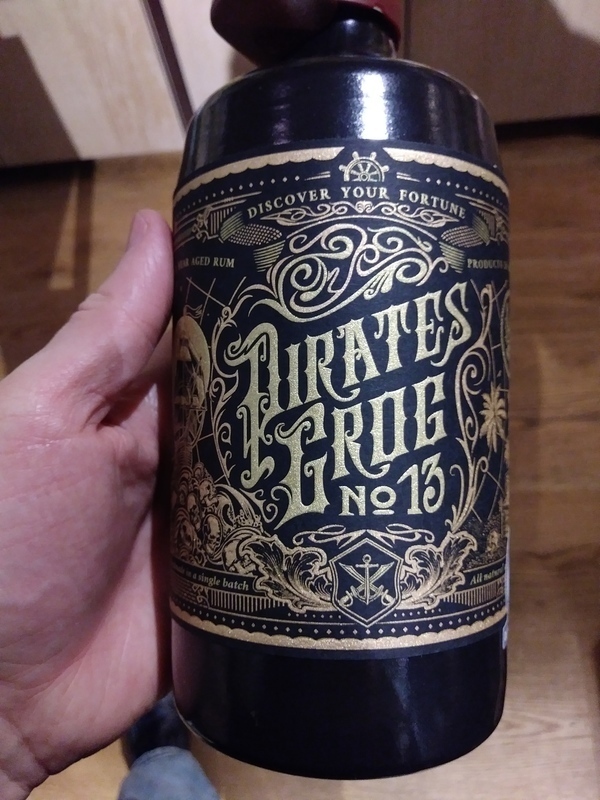 Enjoyed some Pirates Grog No. 13 on a sunny afternoon. Bottle and label design are unique, but they look quite cheap. Golden color. Cocoa, vanilla and oak straight to the nose and palate. Strong burn at the end. Definitely not worth the $85 price tag. Decent cocoa aroma, gentle sweet flavour, a touch of raisins. A lot of heat for a rum aged 13 years with so much barrel taste. Uncomplicated nose presents a lot of alcohol and burnt cane and that's it. I really like this. A lot. I might add another point to my rating! Its taken me a couple of visits to give this a decent rating. Beautiful bottle and presentation etc. The rum is light in colour , golden straw in fact so no added caramel colouring ? The nose is pretty weak but still has a nice sweetish and fruity aroma. Left to air for 15 mins to let the alcohol vapours escape..
A dry almost whisky like taste but with a nice bit of character , it takes a bit of getting used to. Reminds me of Flor de Cana 12. I like the single cask part but its still only 40%. I prefered this on the rocks after my second visit.. Would i buy again ? Probably not. Another case of a beautiful bottle containing a sub-par rum. Not terrible by any means, but not that good straight. Definitely not worth the high price. Gold color. Gentle nose. Cherries? Smoke? Molasses? Some funk, perhaps. Delicate flavor. Vanilla. A tad sweet. Characteristics of a Bajan or a Demerara. I was surprised to learn that this is actually 13(? )-year-old rum from Honduras—my first from this country. It’s actually pretty good—but both more aged and refined than whatever most pirates got their hands on, as well as a whole lot weaker. Definitely not worth the $80 asking price, but a solid offering nonetheless. A decent sipper. This is probably an 8 rum, but the name and strength are getting in the way. I was excited to try this rum based on its relatively high score of 8.2. But almost all of the 10's came from people who only rated Pirate's Grog rum, so those scores appear to be bogus. This is an ok rum, with notes of chocolate, oak, sugar cane, and leather. Not bad, but not as good as the current score (or price) indicates. Really great rum... long tale and full of rich flavour, one of the best rums i've tried. The packaging is great and comes in a pot bottle which adds to the drinking experience. Some great chocolate flavours! This one gets better the more i try it. It is oaky, has some sweetnes and a litlle sting of alcohol. The finish is smooth enough but i wish it would stay longer. Notes of vanilla on the nose, more vanilla with oak on the tongue, pretty dry finish. Decent rum, but not a standout in my opinion. Een krachtige, sterke smaak die al wat ervaring vereist. De pure chocolade blijft wel lekker hangen in de nasmaak. Exclusiviteit heeft zijn prijs en dat merk je jammer genoeg wel. Prachtige fles. Mooie goudbruine kleur. Drink hem puur on the rocks en laat je verrassen door zijn krachtig karakter. Prijs-kwaliteit niet in verhouding. Een fles met een stoer etiket, een mooie goudbruine kleur. De rum geeft een krachtige smaak in de mond, maar heeft een sterke en scherpe nasmaak, persoonlijk drink ik hem graag met cola waarbij je een lichte nasmaak van chocolade proeft. Super special ! A crazy amount of flavour that stays in your mouth after each sip. Very smooth and leaves your tongue with a very pleasant tingle ! Only a batch of 777 bottles, im gonna get another while there availible ! What a great concept. A different age gives a different flavour. Chocolate tones everywhere and amazing as an old fashioned. Notes of white chocolate, vanilla, soft leather, apricot and peach. Mainly single cask 13 year aged rum blended with the original Pirate's Grog 5 Year recipe. Available with or without the gift chest.